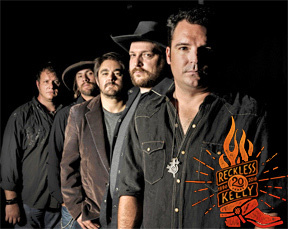 Reckless Kelly will grab you on first listen and pull you in deeper with each play, and their live shows are wild contagious fun. They first gained steam as one of the nation's top Americana projects in Austin, Texas, where their high-energy honky tonk packed venue after venue. "The Austin-based band were Americana before there really was such a term, combining roots, rock and country influences into an uncompromising musical approach that has earned the Grammy-winning group a very steadfast and loyal following. " Now they come armed with a formidable 8 album discography to blow the roof off. Their 2011 Grammy Nominated "Good Luck & True Love," took home four Lone Star Music Awards, and sent three singles to #1 on Texas Radio. And their newest from 2013, "Long Night Moon," was produced by band members Willy & Cody Braun, along with Lead Guitarist David Abeyta. Long Night Moon was mixed by Ray Kennedy (Steve Earle, Emmylou Harris), and features additional instrumentation from legendary steel guitar player Lloyd Maines, as well as Bukka Allen (piano, organ) and Jeff Plankenhorn (dobro). When Willy Braun, frontman and principal songwriter for the band began writing songs for "Long Night Moon," he quickly found a theme emerging. “About halfway through writing this record, I noticed that almost all of the songs I was writing, whether they were songs about the road, life, or love, had something to do with traveling. It started as an accident and I decided to just go with it. Before we knew it, there was a definite theme.” It’s honest, original and constantly evolving. The group is known for their explosive live shows and a passion for making albums of substance. "Long Night Moon" is no exception to this rule.